#iteachmath I invite you to join the conversation! Are you a 1, 2, 3, or a 4? What’s numbers got to do with it?!? I, along with a couple of other teachers, are piloting a grading strategy that is generating some interesting conversations on a DAILY basis with our students! We’ve all read that grades do not improve or motivate learning. In fact, once a grade is given, the student assumes that idea is ‘done’ and drops it, moving on to acquire the next grade. First, I have to give credit for the base of this idea to an amazing educator that I work with every day: Rebecca K. She, of course, credits it to an idea she learned in a workshop some years back. Anyway, she started the year off with a cool bulletin board, that looks something like the image above, which I used to create a powerful way to motivate my babies to take more responsibility for their own learning! Novice: I’m just starting to learn this and I don’t really understand it yet. I explain to the students that this is where everybody in class starts out. Algebra I will have lots of things that are new to them, and we expect that they won’t be familiar with the material! We don’t expect them to know it all before we teach it. Sounds obvious, right? Sometimes you have to be explicit with Freshmen. I think that’s where the name originates! Apprentice: I’m starting to get it, but I still need someone to coach me through it. The apprentice is the beginning of the learning phase. When a student gets a 2 on a problem or a whole assignment, they are in the initial learning stages. As a teacher, I’ve just told them (by marking it a 2) that I know they still need help with the concept, and that I will be supporting their learning. This also tells them that they are not there YET – and that they have room to continue learning. Sometimes we have to give kids permission to not know things YET! Practitioner: I can mostly do it myself, but I sometimes mess up or get stuck. This is a proud moment for most of my students. That little 3 next to a problem or on a paper, tells them so much more than a traditional grade. This sends them the message that I get it that they’ve got it! This affirms their learning. This affirms their work. This is personal. Better than that, this motivates them to keep going, to keep learning. They ALL want to be…. Expert: I understand it well, and I could thoroughly teach it to someone else. Isn’t this where we want our babies to be? You know that if they know it well enough to teach it – THEY KNOW IT!! That peer tutoring thing is for real! Please notice that there are TWO parts of this level: knowing and teaching. My (totally awesome) co-teacher, Stephanie W., and I, use the following grading process. Feel free to modify it to fit your students, and what is happening in your classroom. We know that what we are doing is working for our kids – you may want to start with this, and then modify as you see what is working for you. We give an assignment or quiz. We grade each problem with a 1, 2, 3, or 4. We add up all the grades and divide by the number of items. That gives us a number between 1 and 4. Many times that will generate a decimal, say 1.8 or 2.5, or even 3.8. Here is an important point: we DON’T ROUND UP! We DO EXPLAIN the process to our students. It is important for them to understand that this is not arbitrary. They must own the process for this to work. These conversations happen EVERY time we return an assignment. That’s a GOOD thing! Our goal for our students is mastery, so unless the resulting average is an actual 2 for example, the child is still a NOVICE (1, 1.2, 1.8, 1.9 – doesn’t matter. They are still a 1). Same with 2 point anything – they are still a 2, same with 3 point whatever – still a 3. The ONLY exception is 3.8 and above. If the student has one or more 4+ answers, with clear justification statements, then, and only then, will we round up to a 4. See below for the PLUS explanation! a) Answer that is incorrect, No work shown, or No answer at all: give it a 1.
d) Answer and work is shown and is completely correct. This baby gets the 4! The student can feel the glow of being an expert. But wait, there’s more! This only satisfies HALF of the description. What about the ‘teaching’ part? Four “+”? What is Four Plus??? ‘Four +’ is that special designation for the child who not only knows the material, but can prove to us that they are able to teach the material to another student. Time dictates that we don’t have the opportunity for EVERY student to demonstrate teaching ability (although we do try to build in those opportunities!). We have explained to our students that the way to demonstrate this ability is to justify the work they’ve shown, with brief written explanations. Algebra I is a class of foundations. It is important to teach with an eye to the future courses our kids will encounter, and proofs are some of the most difficult lessons for students. One of the Algebra I standards is to be able to justify the steps taken to solve simple one step equations. This is an important step to understanding that there is a mathematical reason for being ABLE to take that step – and not just because the teacher said so! By building this into the idea of EXPERT, we are modeling the concept that understanding – that is, the realization that there are solid REASONS for why math ‘works’ – is a valuable part of the learning process. What WORDS do you use to tell a parent how their child is doing in your class? I know this is just a brief overview of this process, but I wanted to share because I feel it is the first solid step in moving towards talking about GROWTH and LEARNING, instead of grades. I believe it is important that we take the focus off of grades, for students and parents. To do that, we, as teachers, have to stop using GRADES as the unit of measure in communicating with our students and parents. Unfortunately, our grading systems, and I’m talking the actual computer systems we have to use, are not set up to show mastery – they are set up to show GRADES! I already changed my conversations, my wording, my language, with my students. It will happen with my conversations with parents in my next phone call/email home, as well. Will YOU? My school still uses a grading system built on averaging traditional grading numbers. That means I can’t just put in 1, 2, 3, 4, or 4+. I have to turn these numbers into a grade between 0 and 100 that will accurately translate and describe my students’ mastery of the curriculum. My solution is two-fold. The grades in my gradebook are tied to one of the required standards, and each of the above levels is tied to a number that has already been given meaning by how it is used as a grade. While the first is fairly easy to accomplish, the second is based on how parents and students interpret grades. A 100, for example is the ideal. That sends the message that the student has mastery of the assignment, or the course. In fact, anything above 93, in my County school system, is an A, and as such, denotes pretty much the same thing as a 100. Same for a B, or a grade in the 80 range. Those two grades are obviously acceptable to most parents and students. The grade of C is a little more ambiguous. The C denotes that the student is somehow less than perfect, but still passing. While a student may be GLAD to have a C – it does denote that the student is doing the work and IS mastering the concept – it doesn’t have the same cache’ as the A and B grades. So how do I reconcile the grades with the numbers? A novice receives a grade of 65. The Apprentice receives a 70. The Practitioner has earned an 80, and the Expert, a 90. The 4+ student will earn a 100, as long as all problems on the assignment or quiz show justification, evidence that they have not only mastered the concepts, but have gone above and beyond to be able to communicate their knowledge with others. The final issue I will address here: What happens when a student makes no effort at all. Our students never do that, do they??? In that instance, the student has given us no information on which to base a grade. Effectively, they have NOT TURNED ANYTHING IN. The grade in the book becomes an NTI, and we are made aware that we need to step up our efforts with that student. An NTI is a zero, until the student completes an assignment on that material, and we can assess mastery. From there, the averaging work of the gradebook takes over, and the grade reflects the whole course mastery. Grades in this context are fluid, and can be changed by future mastery as evidenced by quizzes or testing situations. The system is not perfect, but the teachers with whom this is working believe that we have created a system that truly tells us where our kids are with the curriculum, and allows us to modify our teaching darn near immediately, so that we can address the areas in which they need further help – which is the actual point of all this grading, isn’t it? Here is the poster we use in our classroom to explain the levels. Our students get their own mini copy for their notebooks. 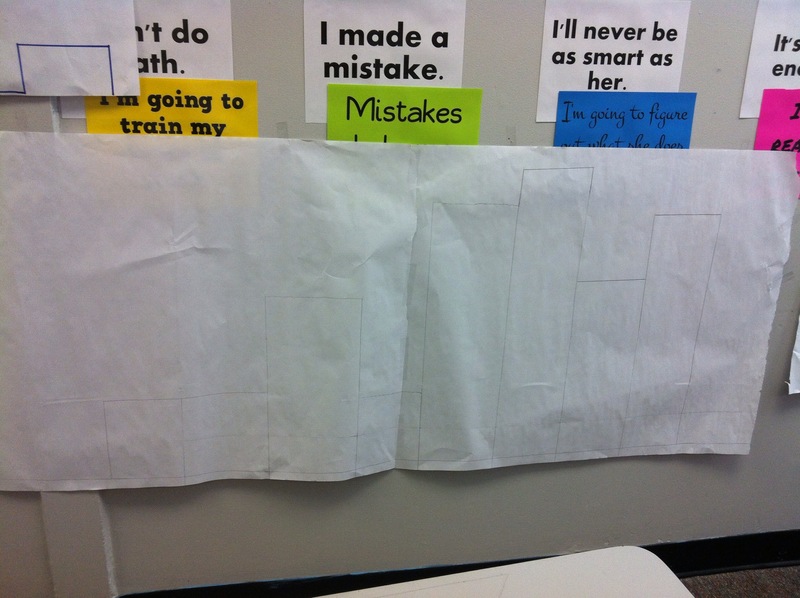 We utilize a small chart of “I can” statements for each unit – no more than 3 – 5 statements – that allow the students to chart their progress. Here is the chart for our Unit 1 standards. The kids get this, too. You can use any “I can” statements you need for your particular units. At the beginning of each unit, the STUDENTS determine their pre-assess level, the quizzes give them the mid-assess levels, and then the unit tests are the post-assess level. The students keep track of these themselves. We incorporate a running conversation DAILY of what their goals are, where they think they are with these goals, and how they are going to get to the 3 and 4 levels. I have personally found this is a great way to have the students tell me where they are at the end of instructional and practice periods throughout class. I simply ask them where they think they are – 1, 2, 3 or 4. The majority of students are incredibly honest, because we are all speaking the same language. The ability to quickly assess and modify my teaching is been made incredibly easy! Grading has become a process of assessing growth, not despairing over what they don’t know. I LOOK FORWARD to grading the work, knowing most of my students WANT to have a conversation about where they are, and what they need to do to get to the next level. Let me know if you would like the rest of the “I can” levels we are using with this course. I’ll be glad to share! We’d like you to take over this class, six weeks into second semester…. Six weeks into second semester, I was asked to become the teacher for a group of Algebra II students. Some days teaching are just better than others! This is a blog that got written, but not posted. This semester I have a different group of kids, and as I read this post, I was reminded of how much fun we had last semester. And I am thankful for all the days since this recorded day in September with these awesome kids! Tuesday is a “Formative” assessment, a pencil and paper, constructed response. You know the drill… “The students will be able to…. ” Anyway, I knew from my informal formative assessments last week that I needed to make sure my students understood how to build a histogram from the data before they tackled this test. We had a set of data on the heights of all the students in my classes, in inches, so I decided to stick with the familiar. I scaffolded by asking them to create a stem and leaf plot of the data and we ended up with three lovely rows of 3 leaves, 25 leaves and 7 leaves. I had them turn the stem and leaf plot sideways. “What does it look like?” I asked. 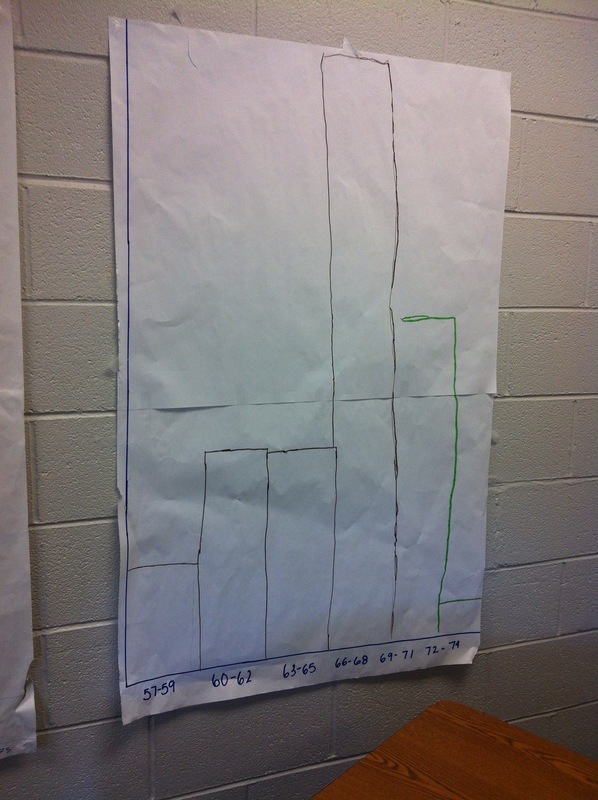 “A histogram,” said one young lady. “Oh yeah,” some said. “I see it now, ” said another. And just as they thought they had deciphered what I wanted, they were given the task of putting the numbers on 3×5 cards and sorting them from least to greatest. Once the cards were laid out, I had them add intervals across the bottom, and frequencies up the side. 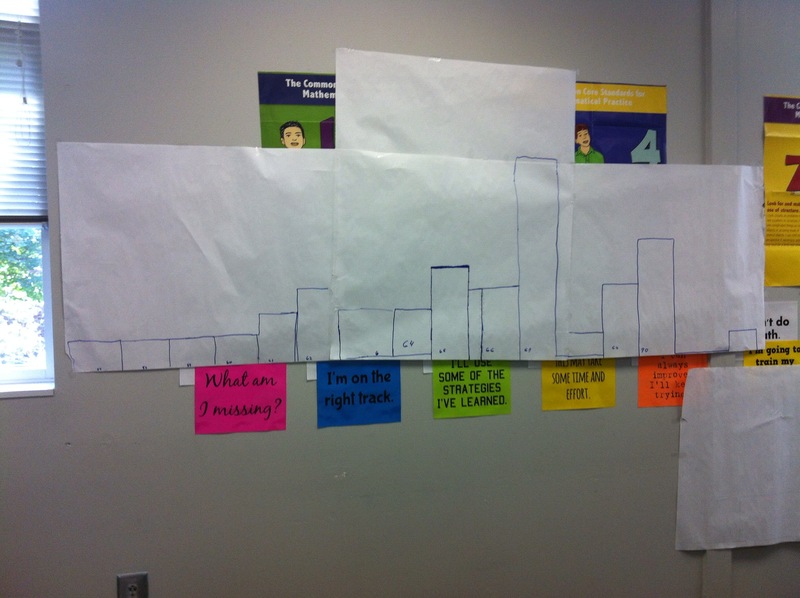 As they worked on the task, they began to realize, if they had not already, that they were actually building histograms, something we had been working around and with in various ways since the beginning of the year. At the bottom of each column of cards students wrote the actual intervals, which meant that numbers were skipped, since not every number between 57 and 74 were represented. I asked those students where the missing numbers would have gone if we had them. After a bit of discussion, they determined that if they had those numbers, they would put them in the same line of the stem and leaf, so they needed to make room for them in the same column with the other cards. Not all students were clear on what we were doing, so I was pleased (an understatement here!) when a couple of students from one group went to other groups and started explaining (!) to the others why they needed to (1) change the bins to cover the missing link and (2) why the bins had to cover the same amount (range) of numbers. problem based task unit which had proved to be a difficult task on a conceptual level for many of them. To correct this, the students decided they needed to spread the numbers out, have more bins… Some students leapt right in and started spreading out the cards. Others couldn’t envision how to start, so I asked them to just start spreading the cards out into smaller groups. One group immediately divided the cards into four columns of ten cards (we had 40 values), and clamored to show me. I asked them to give me the ranges each bin covered. They soon discovered they had the same numbers in more than one column! More shuffling ensued. Ranges were computed. Students debated whether each bin had the same ranges. Maybe more bins were needed, different ranges were calculated, discussed and decided on. Some students had five bins, some had six. 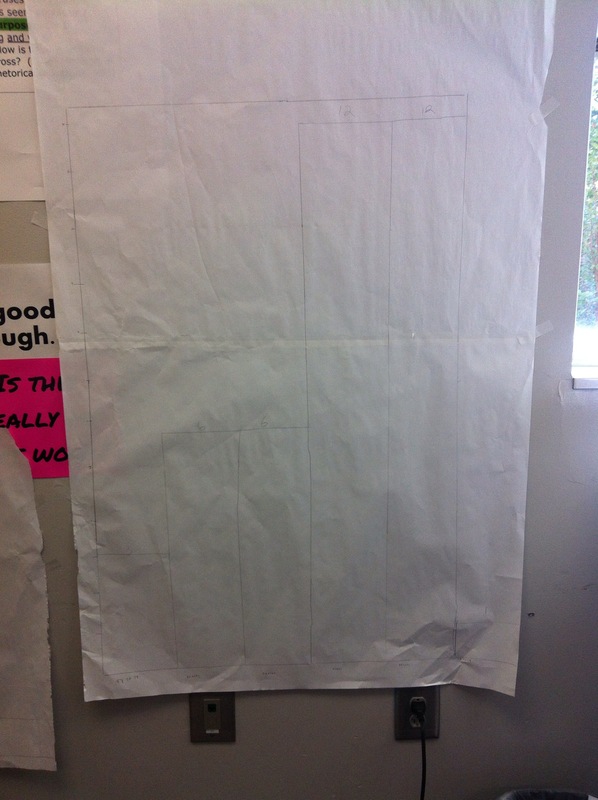 As the bell would ring, I had students leave their unfinished charts for the next classes to finish. I get some students more than once, for classes called strategy class, so after first period, I had some new students and some students from first period. The first period students had to explain the task and help the current period students finish. I was also challenging them to find different bin ranges. If they grouped five bins, I would then ask them to calculate for eight. One group decided on 14 bins, with one number falling in each bin. After each group felt they had the best arrangement, the students would outline the cards to create bins, recalculate the frequencies, and remove the cards. Once we had the drawings up on the wall, I asked the students to tell me which groupings seemed to be the best distribution and summary of our heights. Which graph seemed to tell our story the most clearly. I’ve included some of the finished product here. I am sorry about the picture quality. Some students’ markings didn’t show up well. Why was this the best day ever? Because my students were totally engaged and learning. I was blown away by the level of engagement shown for this task from all my students, even those who were generally disengaged. The students who came to me twice were leaving and telling me they couldn’t wait for the next period! I wish I could bottle the elixir let loose today! I want every activity I introduce to generate the type of group dynamic, the peer tutoring, the calculations and the understanding that dawned as they calculated different bin groupings. Did I mention that I love my students this year! Each and every one of them! Today was definitely a good day! I let the kids teach today. They (well, most of them, anyway) rocked it out of the park! #MTBoS30 A simple review activity created positive energy in the classroom today. This is a difficult week: End of Course tests are done, finals are a week away. Students tend to relax and give into the end of the year lassitude. There are still a unit test and a performance (writing) assessment to go before the finals, but the students are completely burnt out on anything with the word review in it. 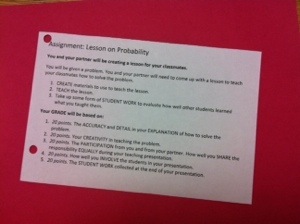 To combat the blahs, I designed a student teaching assignment. Students were paired up and given three brief instructions: create a lesson, teach it to the class, and ask the class to perform a brief activity to show understanding. We assigned each pair a problem from the sheet of review problems for the unit (on probabilities) and gave them 15 minutes to create their lessons. Some students required help with their understandings, and as I walked around listening to the students planning their strategies (20 points for sharing the teaching responsibilities), I was able to discern which students needed help and which ones didn’t. It was an enjoyable day of formative assessment for me, and having them teaching freed me up to spend more time facilitating the learning. This lesson took a block period, which for us means two 50 minute back to back sessions (a regular geometry and a strategies class). This gave us time for a brief introduction to the types of problems that we were going to review, a setup of the task and partnering, and 15 minutes for the pairs to plan. The students really needed about 2O minutes to plan, and we were able to give each pair about 5-7 minutes for lesson presentation and follow up. Assigning the problems was made easier by taping the problem number to every pair of desks. As students came in, we sent the students where we wanted them to sit, which streamlined both the pairing and assigning problems portion of class. 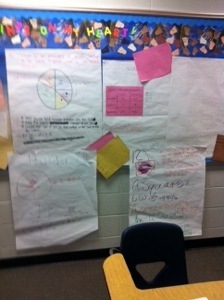 The photos show the wide range of visuals the students employed to teach their lesson. They also used the smart board, however, that was more an electronic chalkboard for them!